Walton on Thames Parish Church is notable in terms of its memorials above all the vast Viscount Shannon monument by Roubiliac, and about a dozen and a half other memorial pieces, including good figure sculpture by Chantrey and Gott and some other sculptural work - see pictures of mourning females above.The Church building itself, dedicated to St Mary, is enclosed enough by trees that in summer at least, no distant view of it can be seen. The Victorians would not have minded, for 19th Century accounts of the exterior are not flattering, referring to anything from the restrained ‘externally far from handsome and hardly picturesque’ to the crueller ‘so greatly deformed by repairs... that it is only noticeable for its ugliness’. 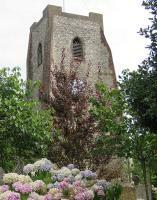 Yet to the modern eye, mine at least, it does have a picturesqueness, with the tower, with its fine flint walling brutally brick-repaired on the edges and top, giving a feel of a semi-ruin poking up above the shrubs within the churchyard. 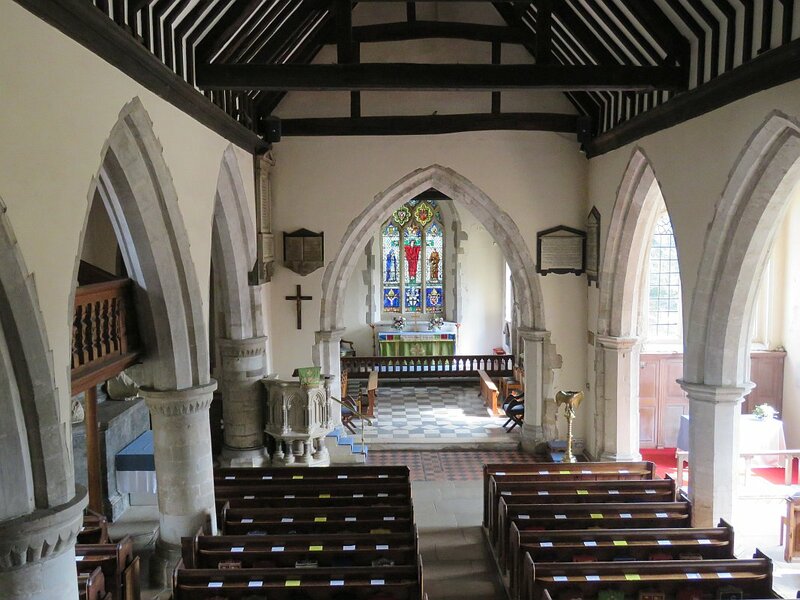 The Church is on a Norman plan, originally without aisles, but then the northern aisle added in about 1160 - the pillars can be seen inside - and the southern aisle in the 14th Century. The short tower dates from the 15th Century, and much of what we see outside and inside is apparently of these 14th and 15th Century dates. At least our 19th Century critics approved the inside of the Church: with its beamed roof and massive Norman pillars, it exudes an air of antiquity and the ambience of nearly a millenium - here some reused brick from Norman times, there a medieval recess or window letting in shafts of light. 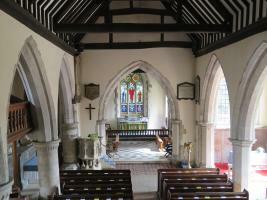 Walton on Thames Church of St Mary, external and internal views . We start with the Shannon monument, and then take the rest in date order. 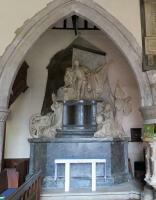 Roubiliac's monument to Viscount Shannon . 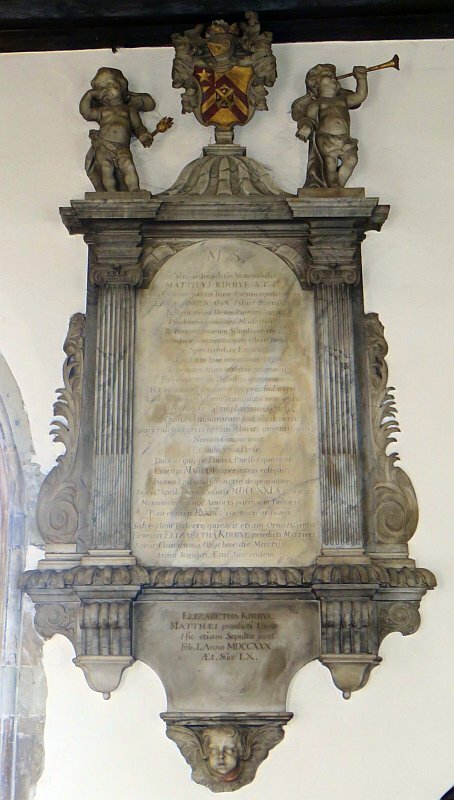 Robert Boyle, Viscount Shannon, d.1740 , the monument erected later in the next decade. 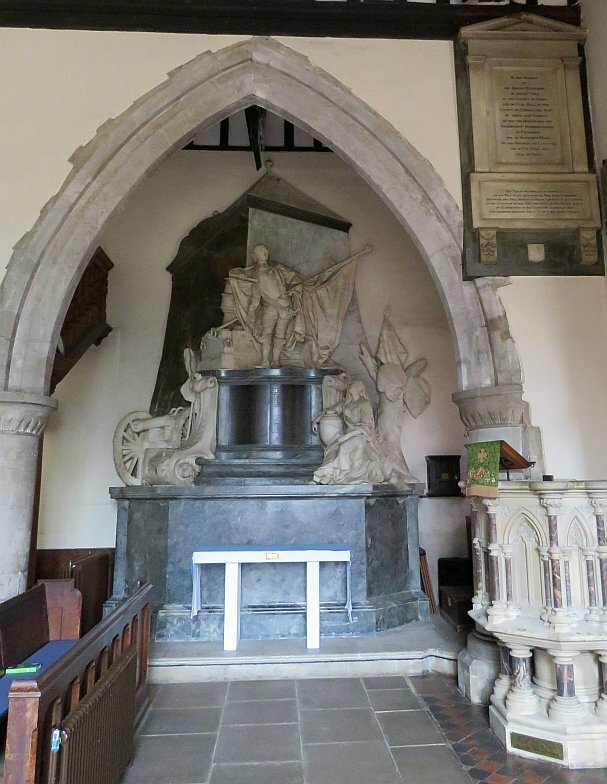 The Viscount Shannon memorial occupies a whole arch-width of the north aisle of the Church, and stands in several tiers well over 20 ft high. 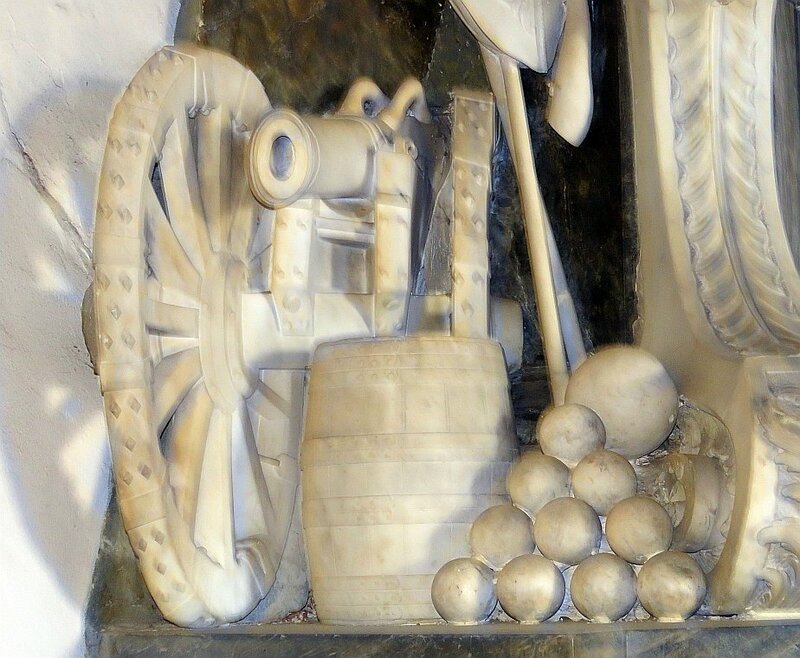 The roughly pyramidal composition of the sculptural elements includes a statue of the Viscount standing on top of a short pillar, with on one side the seated figure of his wife, Grace, Lady Shannon , and on the other, a cannon, barrel of gunpowder, and a heap of cannonballs. The statue of Viscount Shannon is flamboyant and prideful: he is dressed in uniform with a wide robe on top which gives mass and gravitas to the figure. 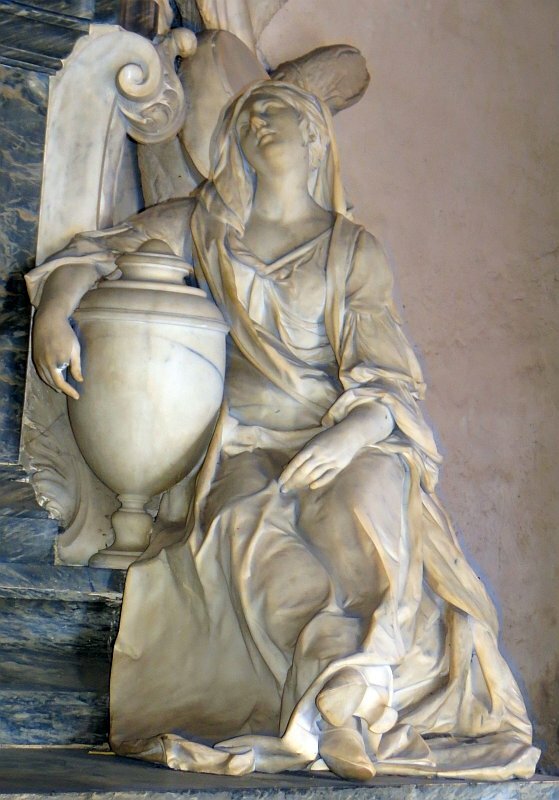 Lady Shannon - if it is her and not the daughter - is seated, one arm around the top of a funereal urn. This splendrous sculptural group is by Louis-Francois Roubiliac, French by birth and early training, but who made his career and lived for most of his adult life in London. 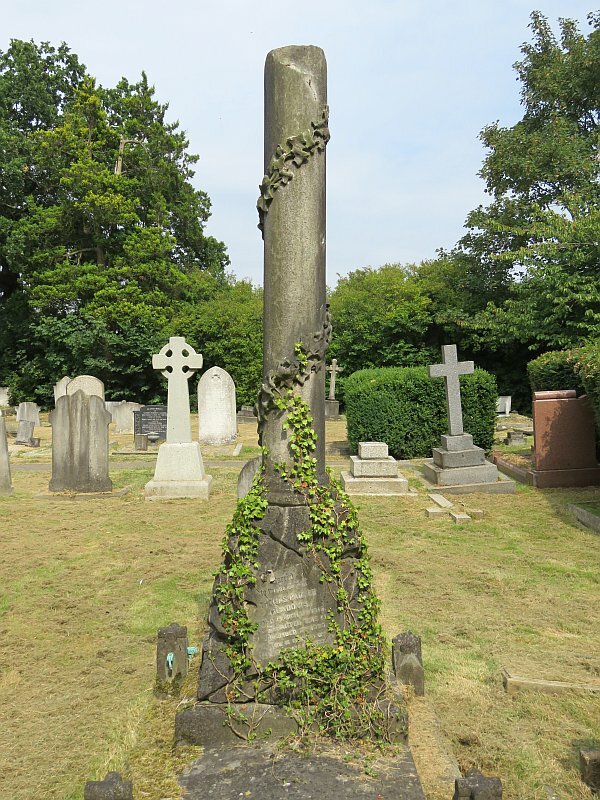 Roubiliac’s oeuvre included several grand works in Westminster Abbey, and this monument in Walton on Thames is the equal of any of them. More on this statue on this page. 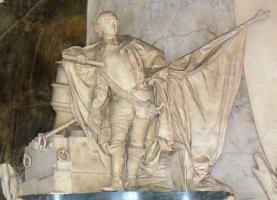 Viscount Shannon memorial: main sculptural elements . John Selwyn, ‘keeper of her ma[jesty’s?] parke of Otelande’, d. 1587 , and wife Susan . 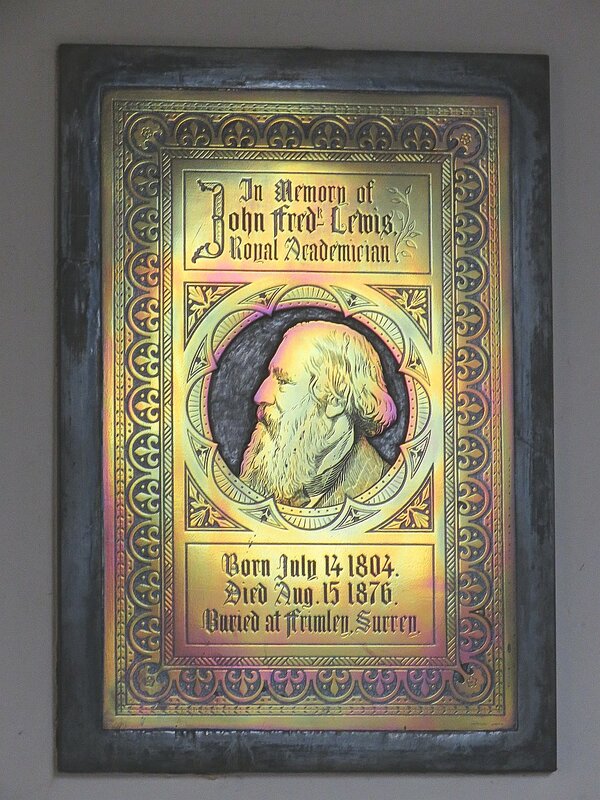 The oldest memorial in the Church consists of a group of brasses, apparently kept loose for a long time, then mounted on oak, and reset in a tablet by Frederick W Smith in 1903. 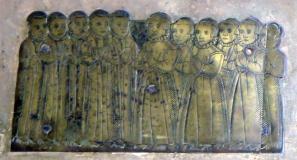 The group includes separate brasses of John Selwyn, his wife, and their 11 clustered children. The adult figures are slightly inwardly turned, and presented standing in the usual praying attitude, he in park keeper’s costume, presumably – jacket and trousers, though still with a ruff, and with his bugle, symbol of his office – and she in a bulky robe and wearing a rather modern-looking hat. The children, robed and all of a size, are five similar boys and six similar girls. A final square panel shows Selwyn again, riding a stag and apparently stabbing it in the neck. The story is that during a stag hunt attended by Queen Elizabeth, Selwyn leapt from his galloping horse onto the back of a running stag, forced it to turn and run to where the Queen was, and then stabbed it dead right in front of her. 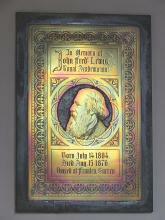 Apparently there is another rendering of the image is on the back of the plaque which cannot now be seen. Massed ranks of the Selwyn offspring, 1587 . Thomas Fitts Gerald [FitzGerald] and Fraunces Randolph , with the date 1617 , though I could not make out much of the text to know if this was the date of death of one of these two. A black panel, hard to read, with a brown and pink alabaster frame characteristic of the early 17th Century; the sides have scrolling, the curved, broken pediment at the as some central symbol, likely the support for a shield of arms. The base has low relief carving – likely the whole thing is just the surviving part of some long lost larger work. Sarah Watkins, d.1710 , and Apolina, d.1706 , mother of her husband William (Guilhelmi) Watkins, with a Latin inscription. A cartouche, with a broad, roughly ovoid surround carved with drapery and scrolling, and incorporating a cartouche of arms at the top, still faintly gilt though no paint remains. To the sides at middle height are a pair of winged cherub heads, and at the base, as a reminder of death for the viewer, or memento mori, is a Death’s head, a bat winged skull lacking a lower jaw. A fine monument – another, larger cartouche is noted further down the page. Sarah Watkins cherub heads, and Matthew Kirbye's cherubs, early 18th Century . 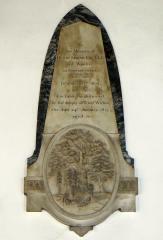 Matthew Kirbye, d.1721 , and his wife Elizabeth Kirbye, d.1730 . With a long Latin inscription. The first in a row of four grand panels (see picture below). 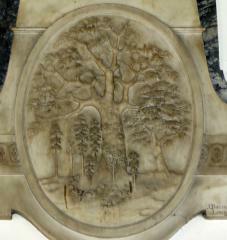 This one is a typical 18th Century Classical panel at the richer end of the scale; the next along (Henry Skrine) is an obelisk monument with a scene carved in high relief; the third (Maria Edwards) is a splendid cartouche, thus going as far from the architectural motifs of the Kirbye monument as it is possible to, and the fourth (Lady and Admiral Williams) essentially consists of a grouping of Classical sculpture with a small base appended for the inscription. The Kirbye monument, then, is a piece of Classical archictecture, with fluted Ionic pilasters to the sides, with scrolly pieces outside and subsidiary to those; arched at the top below a shelf to allow for small spandrels (corner triangles above the arch) with low relief carvings of sheafs of paper and quill pens; and above, a central raised area like a molehill on which sits the coat of arms, carved, painted and with much mantling - a picture is at the top of this page, second from right. To the sides, above the pilasters, are well carved if rather hideous cherubs, free-standing, one carrying a small flame, I think, and wiping his eye on a drape with his other grimy fist, and the other blowing a trumpet of Fame. 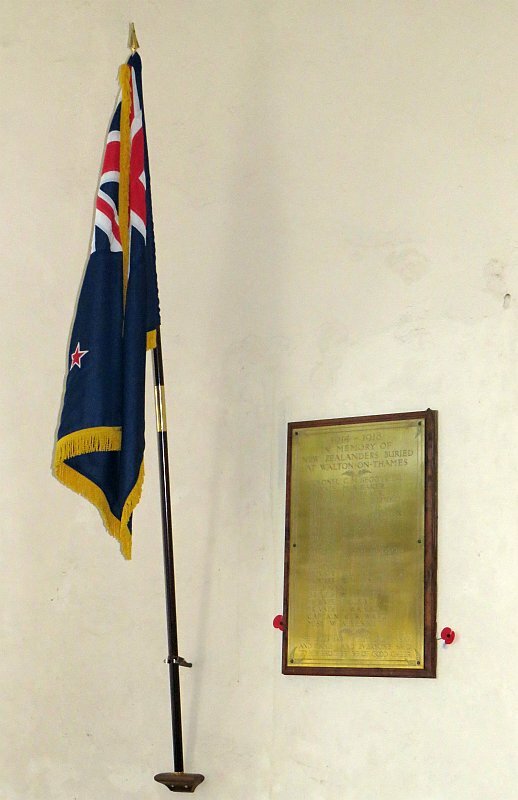 At the base is a thick, gadrooned (corrugated) shelf, held by two heavy moulded brackets, with bell-shaped termini, in between which is a small panel or apron bearing the inscription to Elizabeth Kirbye. A final small shelf under this, and a central supporting winged cherub head. A costly and splendid piece of white and black-streaked marbles. Maria Glasse, d.1736 , a child, daughter of Jacob Edwards, Baronet. With verse, a brief statement in Latin, on a plain plaque with upper and lower shelf and thinnest of borders to the sides. 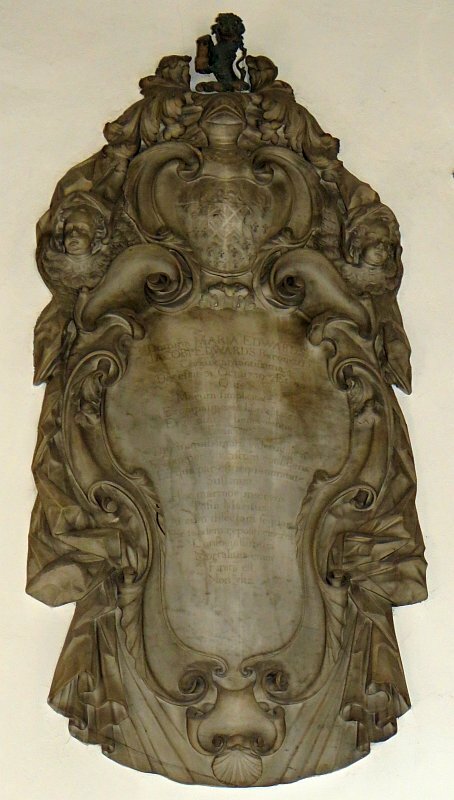 Four grand panels, and cartouche to Maria Edwards, d.1739 . Maria Edwards, d.1739 , wife of Baronet Jacob Edwards, with a Latin inscription. A large cartouche, with the inscription on a violin-shaped panel surrounded by masses of carved drapery and scrolls. At the top, a mini-cartouche of arms, with the mantling echoing the scrolling lower down. To the sides of this, typical for cartouches, is a pair of winged cherub heads. At the base, the drapery, which is caught up with pleasing angular folds higher up, descends vertically in drop folds and a curved hanging (the very lowest part looks trimmed off), and in front of this is another mini-cartouche with a shell. Such cartouche monuments, typically dated from the latter 17th Century through to about 1760, gave the sculptor considerable freedom to demonstrate virtuoso carving, but alas, are very rarely signed. William Lyme, d.1757(?) , wife Mary Lyme, d.1737(?) and others of the Lyme and Wood families of similar date. Cut to a tomb chest end shape with small feet, and a lid above a narrow upper shelf or lip, on a shaped black backing with its own supports. I could not read the dates clearly, but think the panel dates from the 1780s at the very earliest. 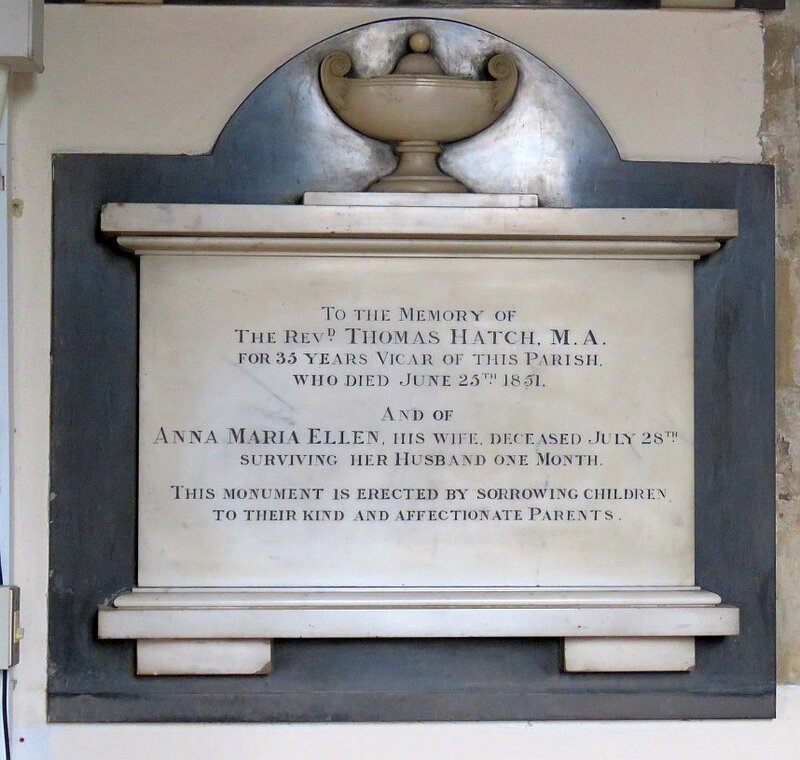 Ann (Newcome) Rodney, d.1774 , parents in law Harry Rodney, d.1737 , and Mary (Newton) Rodney, d.1736/7 – both of these died on their birthdays – and others of the Rodney family. With a black inner frame, then a conventional outer frame. 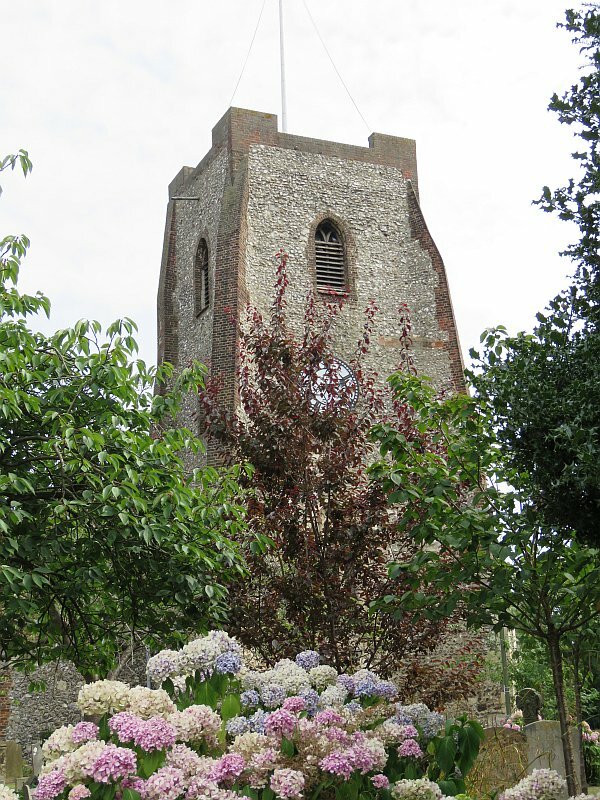 At the top, a garlanded pot carved in relief, and two small flaming lamps to the sides. At the base, a shallow apron and an oval which may once have contained painted coat of arms. Low relief carved patterning, and small relief flowers adorn the frame. John Bacon Junior's obelisk monument to Henry Skrine, and detail of relief carving . Henry Skrine, d.1803 , and wife, Letitia Sara Maria (Chalie), d.1813 . 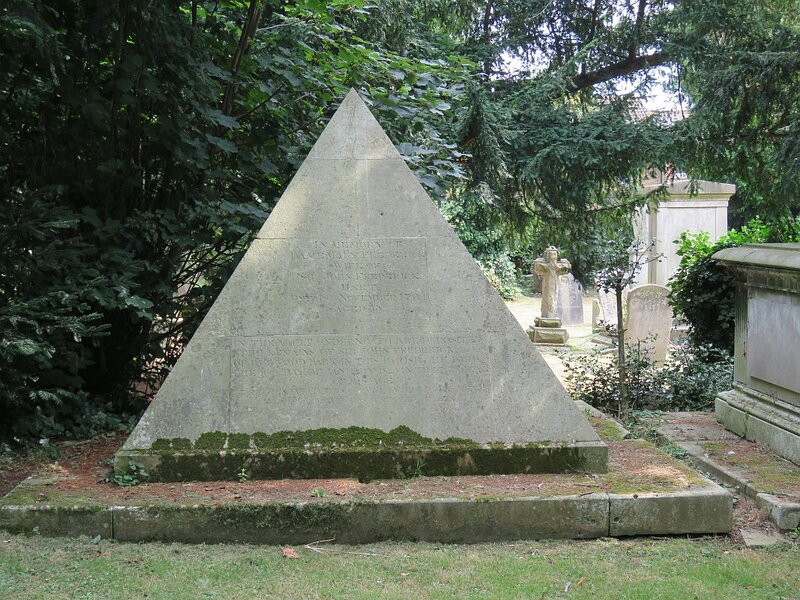 An obelisk monument, not the usual type with obelisk above, clear horizontal dividing shelf and inscription below (as in the D’Oyly monument noted below), but with the inscription on the body of the obelisk itself, and beneath this, broadening out, with most of the space occupied by a large oval containing relief sculpture, showing a woodland scene, with a beautifully naturalistic oak tree in the centre and filling the upper area with its spreading branches, and a smaller oak and several fir trees behind, and minor foliage in front. There is a pun in this, in that ‘skrine-ing’ meant overshadowing, hence the oak tree overshadows the younger trees. Beside the oval is a band of repeating spiral patterns. There is a backing to the upper part of the monument consisting of a gently pointed arched shape, in a dark and white marble. This excellently conceived work is signed by John Bacon Junior, London, and an example of his interest in natural forms as well as the human figure and the arrangement of drapery most familiar to us from his many memorials. More on John Bacon Jr on this page. Sir Henry Fletcher, Baronet, d.1807 , MP for Cumberland for 40 years. 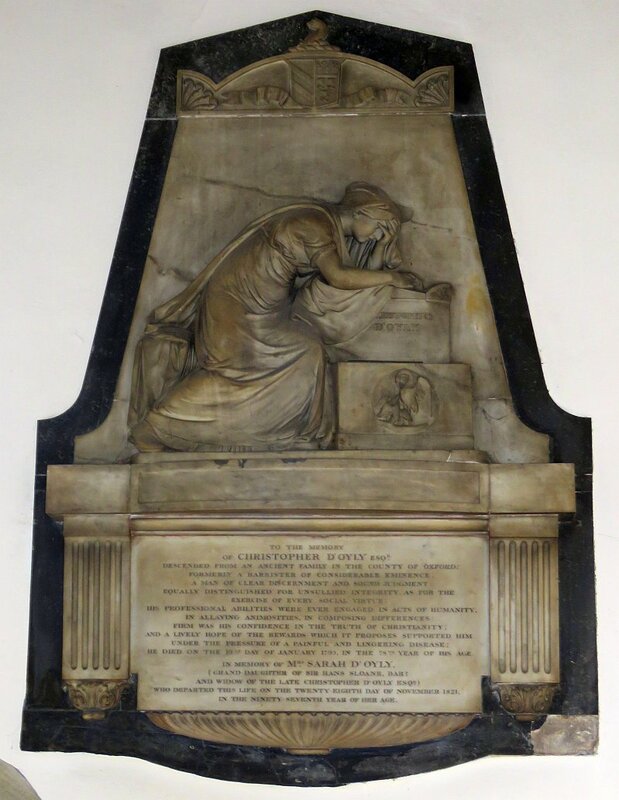 Large, solid and blocky monument of white marble on black, with side pilasters supporting an entablature and blank pediment, blocky base with an inscription to his wife, Catherine (Lintott), d.1816 , who had the tablet erected. Under this are two supporting blocks, with slight carvings of hanging bell shapes, and between them a small shield of arms, now blank. Thomas D’Oyly, d.1816 , Vicar of the Church, and his unnamed wife, d.1833 . Carved in the form of an open book, with his inscripton on the left, hers on the right as we look at it. Below is a broader slab of marble, dipped in the centre, bearing a shield of arms in low relief. There is a black backing to the upper portion, cut to have pediment and acroteria (‘ears'). 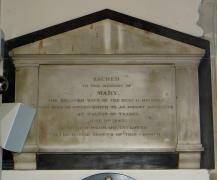 The panel was likely made when he died, with the wife’s inscription added when she died some years later. Christopher D’Oyly, d.1795 , and wife Sarah D’Oyly, d.1821 . 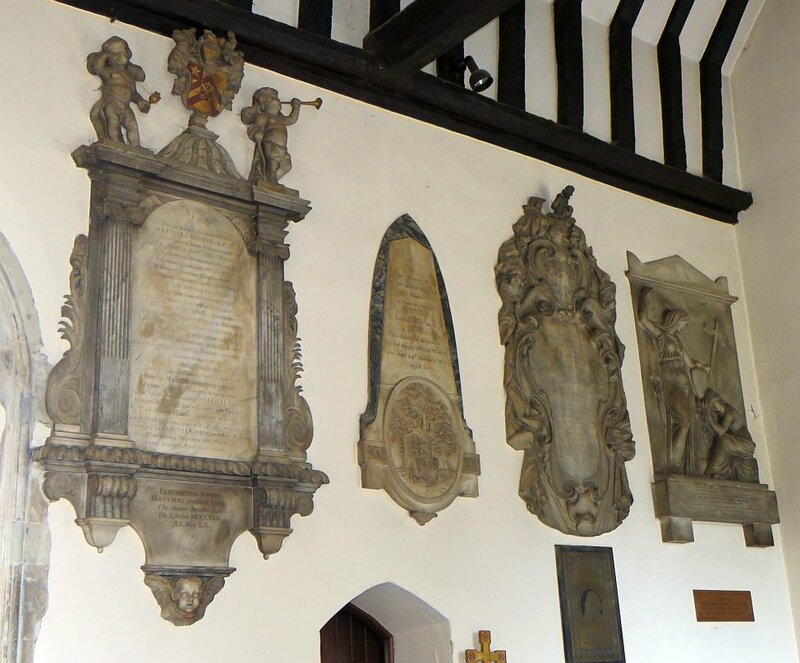 The inscription notes that D’Oyly was ‘descended from an ancient family in the county of Oxford’, while his wife was grand-daughter of Sir Hans Sloane, Baronet (he of Sloane Square, whose collections formed the foundation of the British Museum). 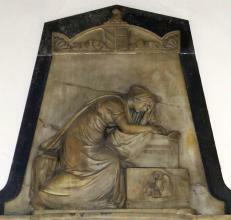 A short obelisk monument, with the inscription below, blocky frame to sides and top, forming a shelf for the figure sculpture, which shows the grieving figure of the widow leaning on the tomb of her husband, which bears his name and below, a rendering of the Pelican feeding her young. 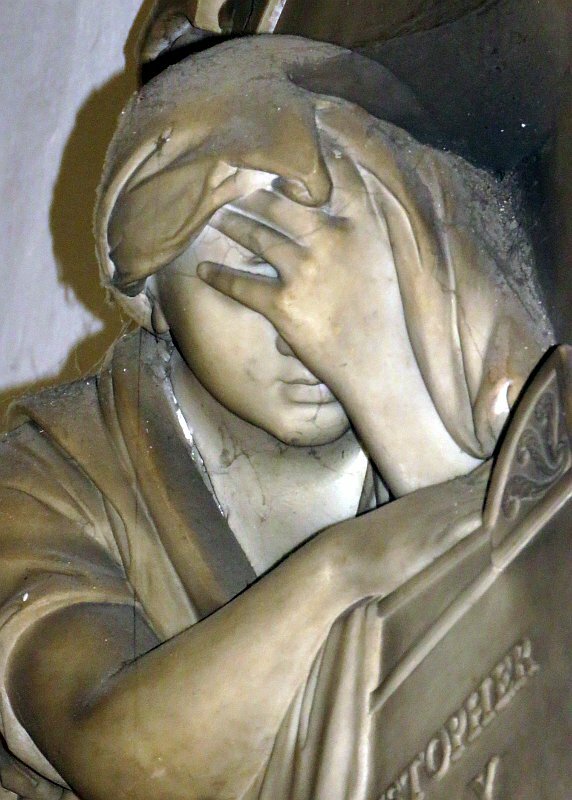 The female figure is youthful, almost girlish, which is some artistic license by the sculptor, as Sarah D’Oyly was over 70 at the time of her husband’s death. But there she is, wrapped in clinging Classical drapery to show the curvy body and limbs underneath, with a subtle twist from the three-quarters view of the legs and lower torso to a profile view above her high waist. She slumps forward, face partially covered by one hand, the other arm embracing the top of the monument. 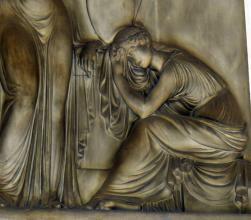 The sculptor of this excellent work was the famous 19th Century sculptor Francis Chantrey, who signs the work on the side of the base. Unlike the case for the Thomas D’Oyly monument noted above (a different branch of the family), the monument was commissioned at the widow’s death rather than after the husband’s (it would have gone to another sculptor had that been the case, as Chantrey would have been just 14). 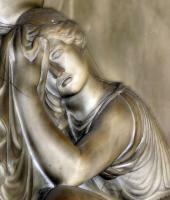 Figure sculpture: Chantrey's Christopher D'Oyly monument and Joseph Gott's panel to Mary Williams . 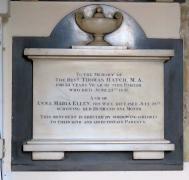 Mary Williams, d.1824 , and husband Admiral Sir Thomas Williams, d.1841 . Last of the line of four monuments noted above, this really does have the figure sculpture predominating, with the inscription relegated to a narrow, blocky base. We see two female figures, standing and seated. 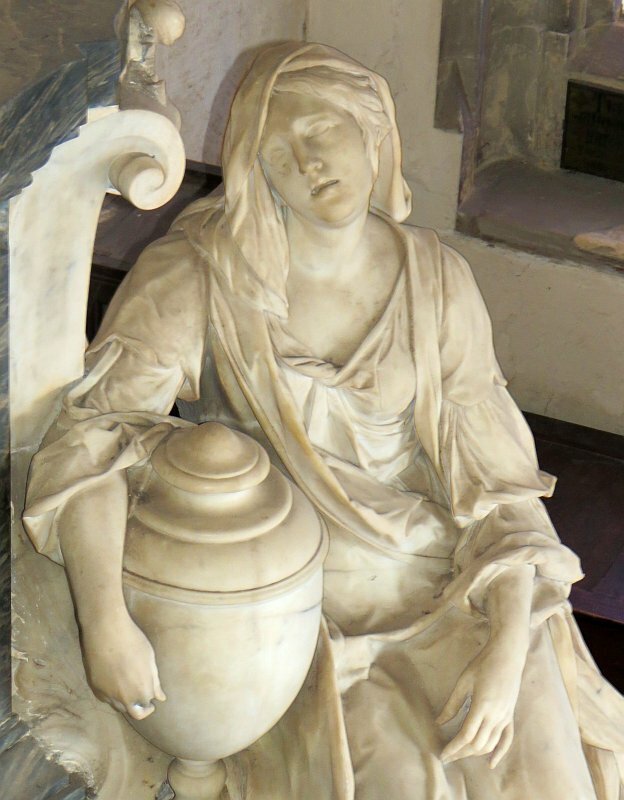 The seated girl rather echoes Chantrey’s figure of the grieving widow in the Christopher D’Oyly monument, slumped forward, head in hand, here with the other arm around the base of a funereal urn – but this can be no widow, for her husband outlived her. 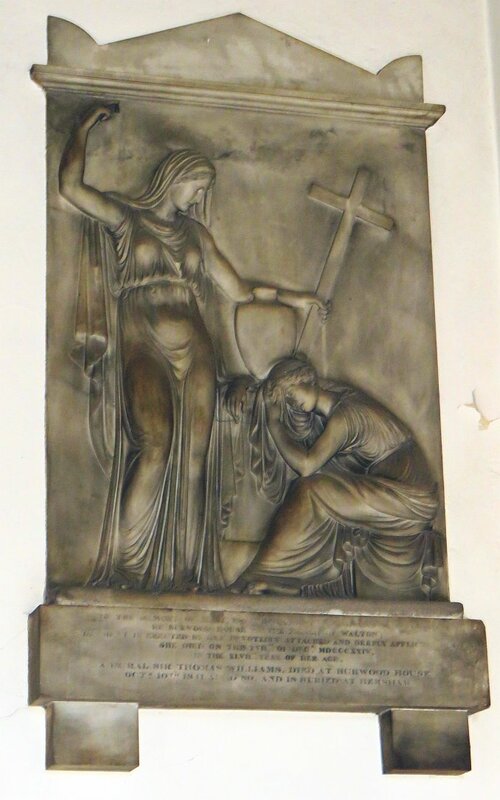 Rather, she is an allegorical statue of Grief, and the standing figure consoling her is Faith (in the afterlife), as we can see by the large cross she carries. Though both wear Classical garments, the statue of Faith is as close to being undraped as can be, her wispy garments accentuating and clinging to breasts, stomach and legs. In their faces and physiques, both figures are Classical, and it is interesting to compare them to Chantrey’s girl of just a few years earlier. 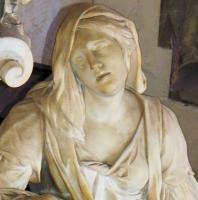 The sculptor of this monument was Joseph Gott, and the monument was completed in 1827, in Rome, where Gott lived. Gott made rather few monuments (one in Bradford Cathedral with a portrait carved in relief is shown on this page). 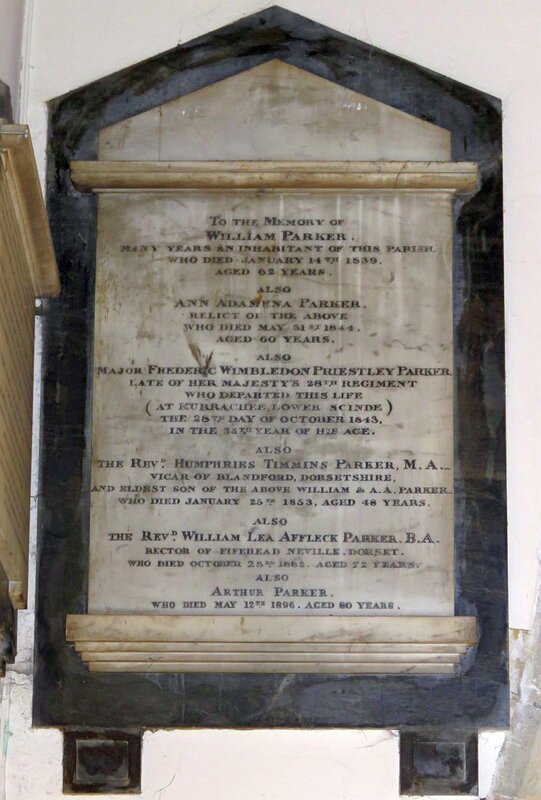 William Parker, d.1839 , wife Ann Adamena Parker, d.1844 , Major Frederic Wimbledon Priestley Parker, d.1843 , at Jurrachee, Lower Scinde, son the Revd. Humphries Timmins Parker, d.1853 , Vicar of Blandford, the Revd. William Lea Affleck Parker, d.1882 , Rector of Fifehead Neville, and Arthur Parker, d.1896 . White panel with thin upper shelf above which is cut to pediment shape, and thicker lower shelf in tiers. On a shaped black backing with supports. See picture a little way down, left. 19th Century white-on-black panels, horizontal format . 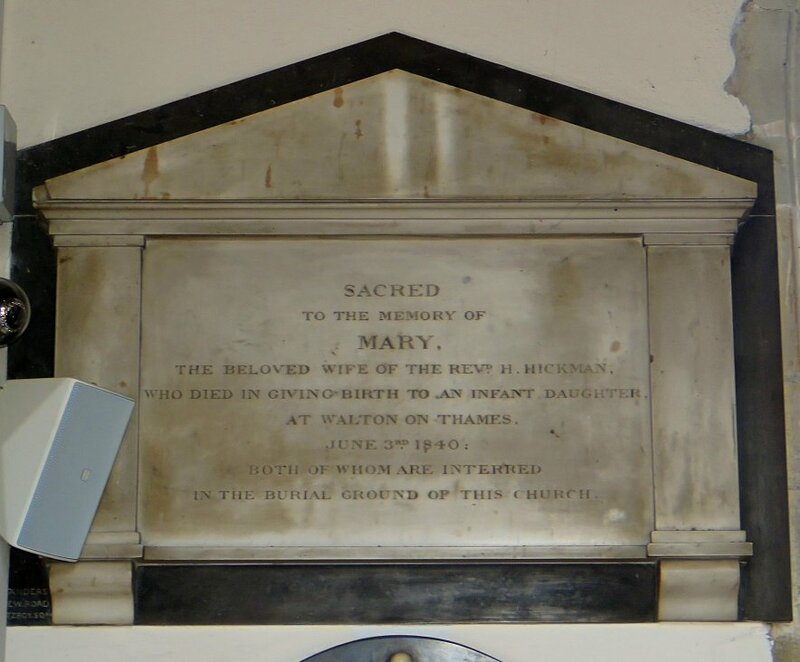 Mary Hickman, d.1840 and her unnamed infant (she died in childbirth). Simple white on black monument, with the inscribed panel flanked by plain pilasters, thin shelves above and below, on the former of which rests a piece of marble cut to pediment shape. At the base are two supports with mouldings, but there is no real carving per se - see picture above left. Signed by Sanders, New Road, Fitzroy Square. 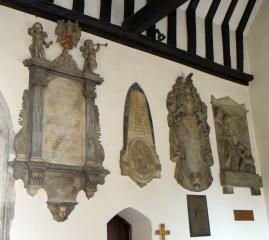 He was a stone mason who has several more ornate works to his name including the occasional figure piece. The Revd. Thomas Hatch, d.1851 , Vicar of the Church, wife Anna Maria Ellen, d.1851 just a month before her husband, erected by their offspring. A neat panel, shaped as a tomb chest end, with upper and lower shelf, little feet below, and on top, a relief carving of a broad, Aladdin-lamp style pot. On a black backing, arched at the top to encapsulate the pot. Picture above right. 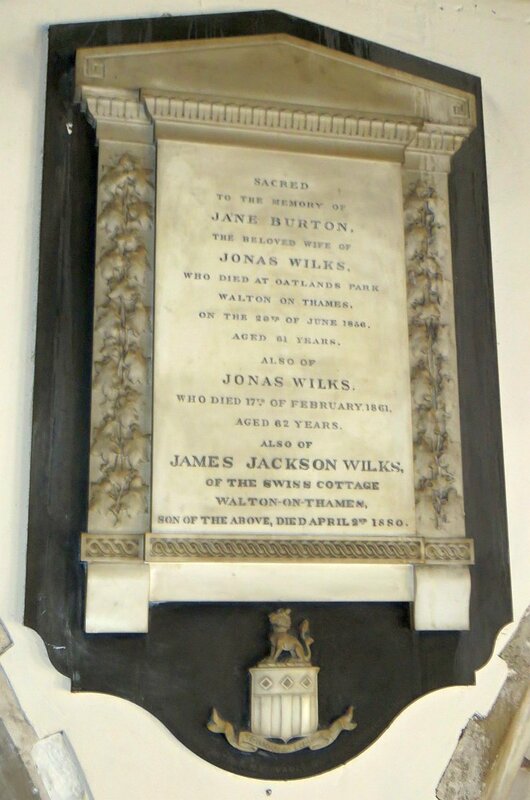 Jane Burton Wilks, d.1856 , husband Jonas Wilks, d.1861 , and their son James Jackson Wilks, d.1880 . 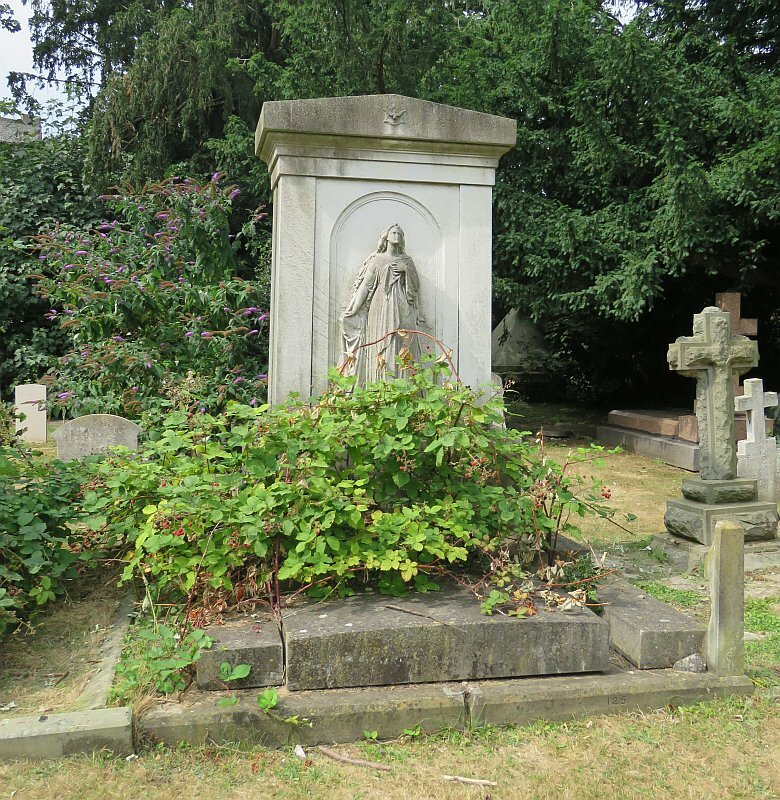 Tall monument with receding side-pieces, upper and lower shelf, low pediment on top, and little feet - see picture below right. Enlivened by lines of repeating carved patterns above and below, and decorative vines climbing up each side. At the base is a small shield of arms with the motto ‘Toujours Fidele’ (Always faithful). White-on-black panels, vertical format . John Frederick Lewis, d.1876 . The inscription notes he was a Royal Academician – but J.F. Lewis was not just any RA, but a contemporary of the Pre-Raphaelites, with a similar love of verisimilitude and the effects of light on colour, who made his name with Orientalist pieces showing scenes of Middle Eastern life, typically beautiful exotic girls in harem scenes and the like, a generally popular concept to the Victorian male. The panel to him is a modern brass, an art form revived during Victorian times which continued into the early 20th Century, typically with ornate black lettering, and an inscribed line border with repeating decoration as here. In the centre is the profile portrait of J.F. Lewis, showing him with high forehead, a strong nose of force and character, and a vast flowing beard and moustache. 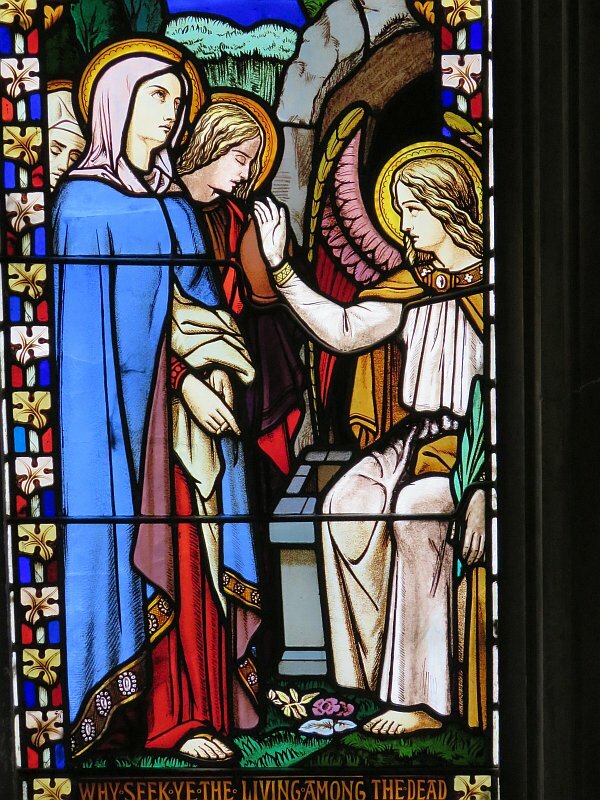 There are a couple of modern panels, including Alison Jardine, d.1936 , a plain panel with a nice letter font, and Robert James Pearce, Priest, d.1974 , completely plain as is now the custom. John Frederick Lewis monument, Orientalist and almost Pre-Raphaelite . As well as the ancient brass to Selwyn, there are a couple of modern brasses , in typical style. 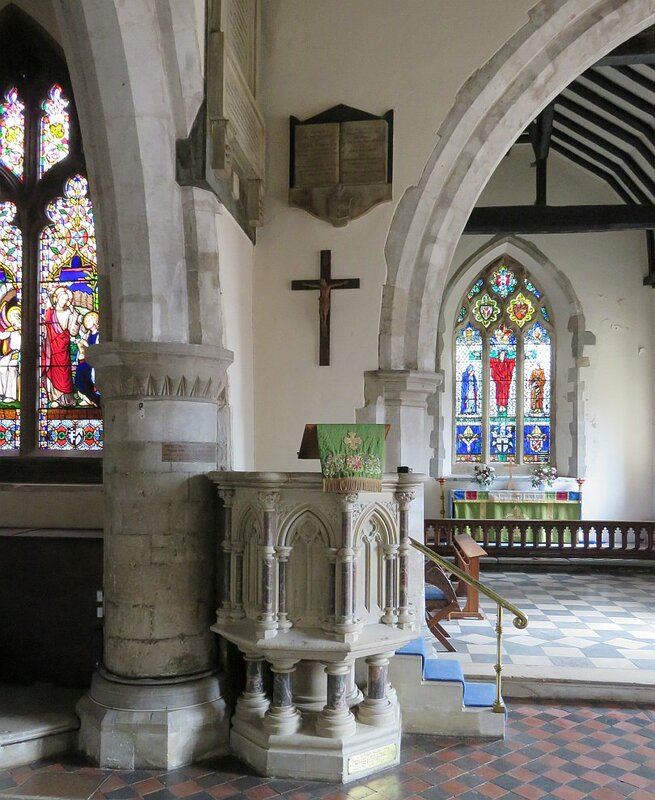 The font , octagonal, massive-based and wth quatrefoils and trefoils in panels around the sides, early Victorian (1845) with a tall steeple cover. 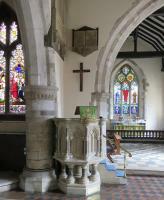 The pulpit , also octagonal, white stone, here with the base with a central shaft and smaller surrounding columns in coloured marble; above, the sides have Gothic windows with smaller coloured columns. A curious mix of Gothic with a hankering back to the Norman.Given by Fanny S. Gill, 1902. 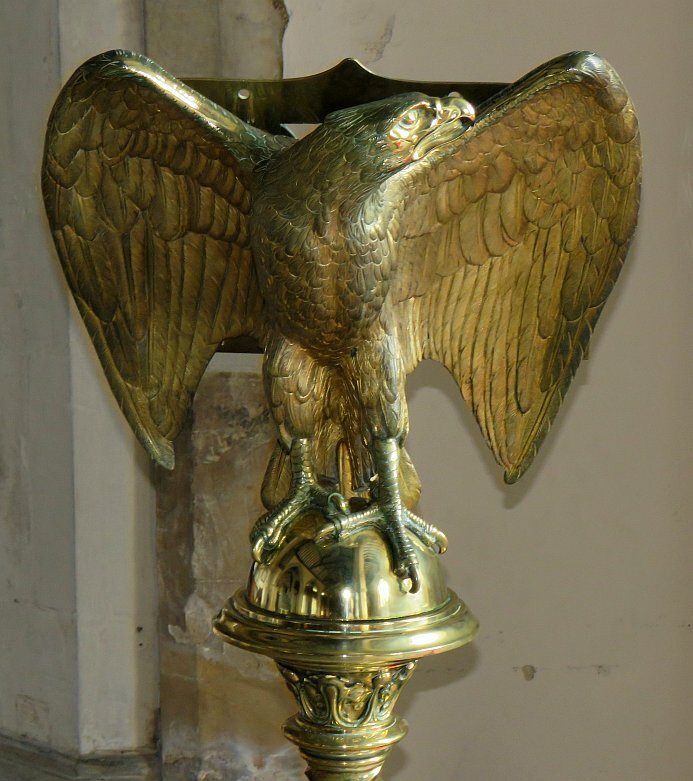 >A large eagle lectern in brass, more finely made than the usual, dated 1896, gift of Richard Wilcox Boyle. 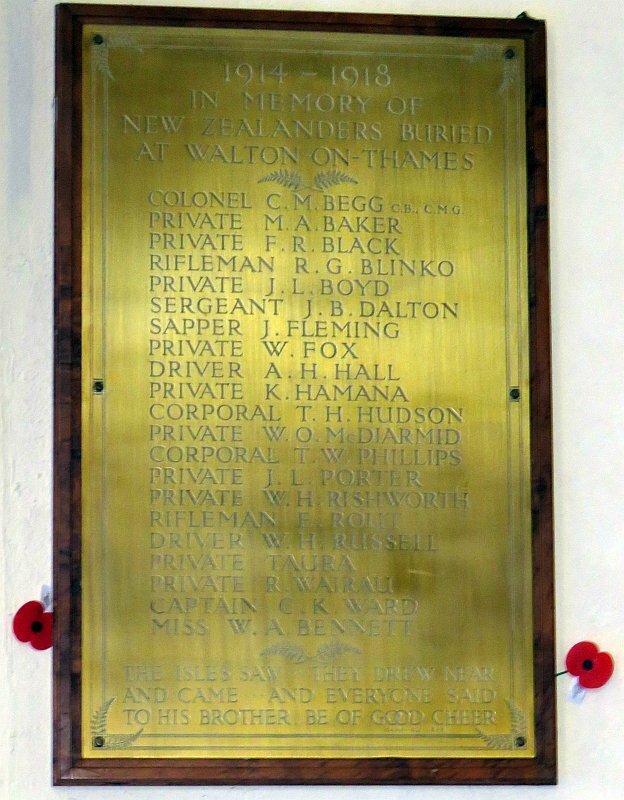 Two World War I memorials , both consisting of brass plates with the names of the fallen, one to men of the parish, the other to New Zealanders buried at Walton on Thames – there was a large contingent from New Zealand a hospital in the town in World War I. 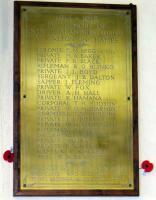 See picture below - you can read the names if you click to enlarge. New Zealand memorial in Walton Church, eagle lectern, and pulpit . Dame Mary Frederick, d.1791/4(?) 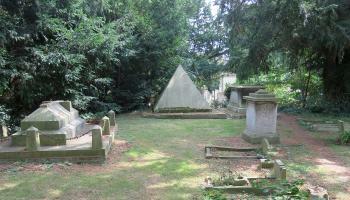 and added later, her husband Baronet Sir John Frederick of Burwood Park, d.1825 . 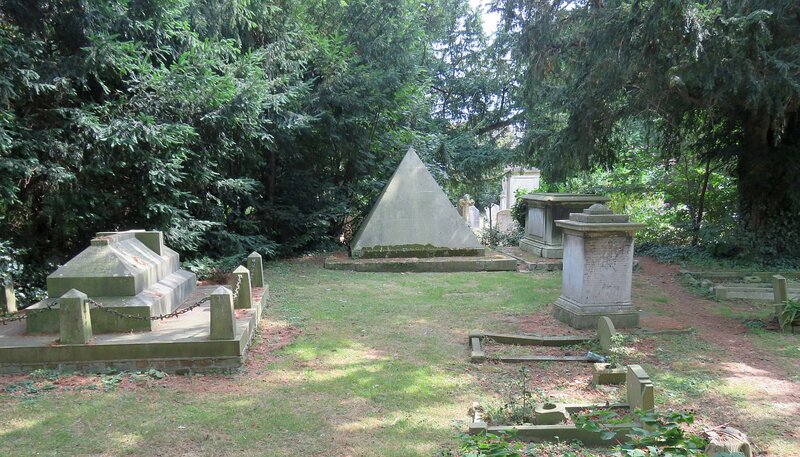 Although Ancient Egyptian motifs were popular in monuments both inside and outside the church, they generally took the form of tall obelisks, Egyptian pillars as at Highgate cemetery, and the occasional sphinx, and actual pyramids are really rather uncommon. This monument is a good example of such a pyramid, hidden away under a tree and worth seeking out. 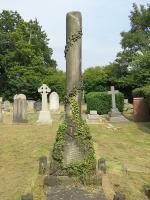 Column with real and carved ivy, view in churchyard, and the Dame and Baronet Frederick pyramid . The memorial to George Virtue, d.1868 . 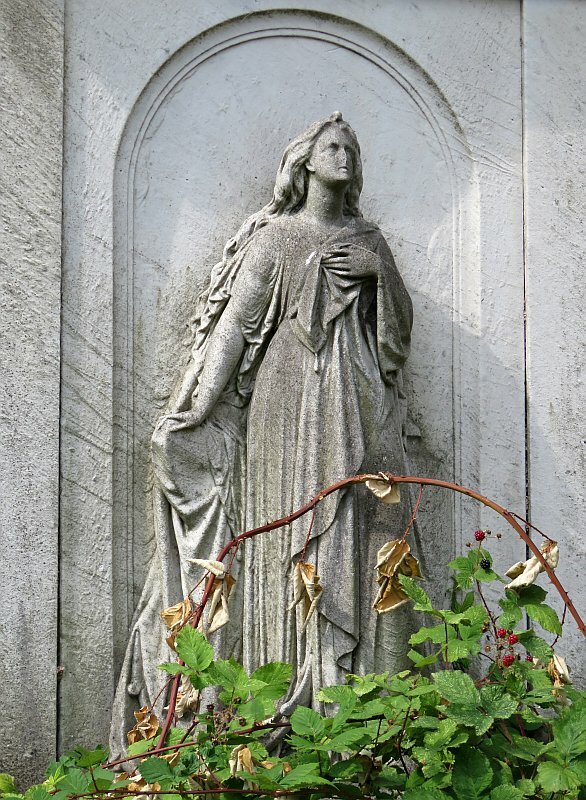 It includes a standing girl, looking somewhat upwards – perhaps Virtue’s wife Helen, or an allegorical figure, more individualistic than most churchyard sculpture, and most graceful despite some weathering to the head, and being enmeshed in a disturbingly lush growth of blackberries. The sculptor was Joseph Edwards, a sculptor of busts and monuments whose skilful rendering of the female form never really gained him the distinction he might have had. George Virtue was the publisher of the Art Journal, most prestigious (and informative) of the 19th Century art magazines, which had engraved several of Edward Joseph’s works in the 1860s. 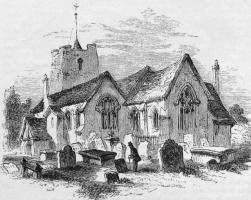 Virtue lived in Oatland Park, which we may recall was where John Selwyn, the subject of the earliest memorial in the Church, had been keeper hundreds of years previously. 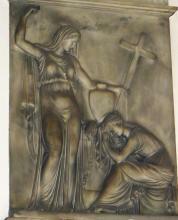 George Virtue, d.1868, publisher, memorial by Joseph Edwards . 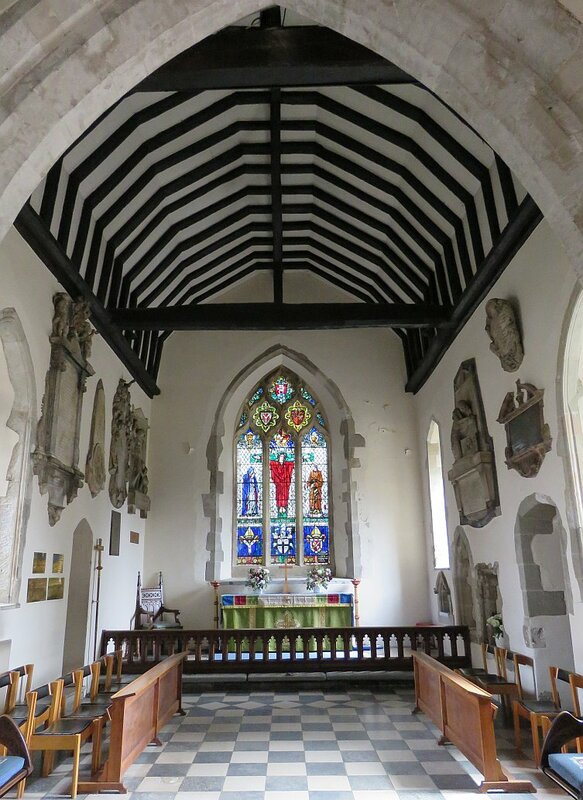 With many thanks to the Church authorities for permission to show pictures of the monuments inside; their website is http://www.waltonparish.org.uk/about/st-marys/our-story.